260 Commercial Real Estate and Properties in Nsw Mid North Coast are listed in 9 categories. We have 83 Retail Shops for Sale & Lease , 77 Offices for Sale & Lease , 38 Industrial Warehouses for Sale & Lease , 25 Development Lands for Sale & Lease , 15 Commercial Farms for Sale & Lease and 11 Other Commercial Properties for Sale & Lease . Well Priced Priced Office Space $2340 PCM + GST (includes.. This well appointed office space is located in a quiet street at the front of the complex. Currently figured to support 3 open plan office areas and multiple offices over two levels. This 197sqm suite includes internal kitchen and bathroom amenity and abundant onsite parking at the front door. You wont find reasonable quality office space at this price anywhere else. FEATURES 197sqm Net lettable area over two levels. Located in secure gated complex. Airconditioned. Data cabled. Front of complex with glass facade. Abundant onsite parking spaces. PRICE: $2340 PCM + GST (price includes outgoings). To arrange inspection contact local leading commercial agents Towers Francis Property. Main Street Location Rent - $2,854.17 pm + out..
Are you looking for the very rare, yet premium property combination of rural lifestyle and rural industry? Presenting to the market, this incredible 16 acres (6.5 hectares) located on the most elevated ridgeline of Duranbah, inland of Kingscliff, on the pristine Tweed Coast of Northern NSW. This property lends itself to a myriad of buyers, including an Owner Operator, an Investor or Retreat Owner Operator as it boasts substantial infrastructure with a Hamptons Homestead, a large ‘Workers’ Cottage, as well as a Barn Style Lodging Rooms, which both provide an established rental accommodation income. The property also boasts additional buildings which relate to the current owner’s vegetable and herb growing business. Truly this property can be tailored to your desired use! You have the option to capitalize further on this land with future growth evident by the granted DA Approvals; (please see portfolio) Furthermore, the adjoining boundary land to the Kings Forest Residential Development has been identified as ‘Future Urban’ allowing future development potential of the current farmland to be highly valuable and I would classify as a significant developmental asset for potential investors! In summary the Residences include: The main Hamptons Style Homestead featuring 4 bedrooms, 3 adjoining ensuites, plus an extra wc powder room, open plan kitchen to dining room which extends to the expansive covered outdoor entertaining verandah, separate living room, 2 study’s, sunroom, laundry, swimming spa, secondary level loft space and double carport. Quality fixtures, appliances, reverse cycle air conditioning and ceiling fans are throughout the home. Enjoy the picturesque views of the ocean to the East, Mt Warning to the West, and rural beauty to the South. The Managers/ Rural Worker’s Cottage provides 5 bedrooms, 2 bathrooms, kitchen, large family living and dining area, enclosed sunroom perfect for a meals area, storage room, Northern and Eastern patios with views, parking space and a large outdoor pergola with wood fire pizza oven. Air conditioning and celling fans throughout. Fully equipped with furnishings, the house returns at maximum capacity $1,250pw. The two storey Barn Style Accommodation boasts 5 bedrooms, 2 offices, living/ dining, kitchen, bathroom. Also fully equipped, the current income exceeds $500pw. 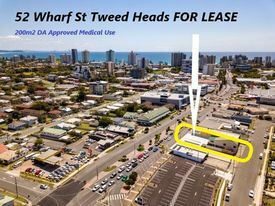 The property is accessed by a complete bitumen road and is positioned only 8km to the pristine beach /estuary, bustling esplanade of shops and cafes, primary and secondary schools, TAFE, plus all amenities of the Kingscliff township, including the soon to be constructed new Tweed Hospital. A 5 minute drive to the motorway allows access to the Gold Coast Airport and Southern Cross University within 20 minutes. A rare opportunity for buyers is offered in this scenic and dynamically growing region, please contact our agency to receive an extensive portfolio outlining further property and business details. This office is located on the ground floor corner of the building with excellent exposure and signage options. The current configuration supports reception, one office, kitchen and toilet amenities. FEATURES 39sqm Airconditioned Abundant onsite parking Professional tenancy mix including medical and professional services. Ground floor Excellent signage options. PRICE $1190 PCM + Outgoings ($139 PCM) + GST Call exclusive agents to arrange an inspection. 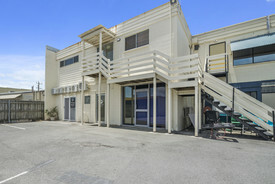 Dont miss this opportunity to secure this professional office suite in 'Kingscliff Central'. Office suites in this building are tightly held and rarely available for sale or for lease. 'Kingscliff Central' is host to a myriad of professional and corporate businesses including but not limited to; national banks, planning and certification, design, financial services, Government funded and many other corporate office businesses. Suite 18 is located on the first floor of the building with attractive office entry for clientele. FEATURES: 65sqm internally 2 designated secure basement carparking spaces for exclusive use. Current layout supports two private offices/consulting rooms, open plan area and reception. Lift access to all floors and parking levels. High speed P2P internet available with great priced plans. High quality building in excellent condition. Landmark easy to find building. Perfect for professional image for your business. Air conditioned. Internal kitchen. Toilet amenities on each floor of building. PRICE: For lease: $2200 PCM + Outgoings. For Sale: $385,000 (GST exempt). For more information and to arrange inspection, contact exclusive selling agents Towers Francis Property. Medical/office Use Da Approved Central Business District Location Rent To be Negotiated in .. Brand new multi level market hub comprising 8,500m² of boutique retail on Byron Bay's Jonson Street Australia's first ever Five Star Green Star Retail Design rated shopping centre Prominently anchored by a 3,500m² new concept Woolworths and the 9 theatre Palace Cinema Remaining tenancies range from 12m² kiosk offerings to large format 170m² + retail and food beverage tenancies Ample customer parking with 337 basement car parks over two levels including Electric Car Charging Bays Mercato on Byron is anchored by a brand new 3500m² Woolworths brand new 9 theatre cinema representing the only neighbourhood shopping centre in the area. The specialty retail space has been carefully designed to offer the convenience of a modern retail hub while maintaining the local ethos by using natural, recyclable and locally sourced materials. 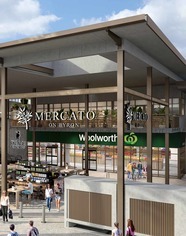 As Australia's first Green Star rated shopping centre, Mercato on Byron features solar electricity, electric car charging bays ample bicycle parking, ensuring it leads the way in creating an environmentally friendly and aesthetically pleasing centre benefiting both retailers and locals alike. Here, both local and national retailers can collaborate and capitalise on the growth of the area. National retailers include Woolworths, Palace Cinemas Bed Bath Table, El Camino Tex Mex, Livelife Pharmacy and the Reject Shop, in addition to highly regarded local and regional operators including Chichetti Italian restaurant and Lennox Heads own Beef+Beach restaurant. We are seeking the below tenants for the few tenancies remaining. Restaurant/sudo bar with impressive outdoor balcony dining space Artisan Bakery Delicatessen Butchery/Seafood Healthy Eating Juice Bars Ice creamery Traditional Barber, hair/beauty/cosmetics Cobbler Wholefoods grocer/ health food Fitness/wellness operator including Yoga Pilates Local Gallery event space operator Trade area profile: 33,987 residents (ABS ERS 2017) in the Byron Bay shire area with approximately 1.8 million tourists pouring into Byron Bay per year! This is an opportunity not to be missed! Enquire Now! Approximately Disclaimer: Ray White has not independently checked any of the information we merely pass on. We make no comment on and give no warranty as to the accuracy of the information contained in this document which does not constitute all or any part of any offer or contract by the recipient. Prospective purchasers / lessees must rely on their own enquiries and should satisfy themselves as to the truth or accuracy of all information given by their own inspections, searches, inquiries, advices or as is otherwise necessary. No duty of care is assumed by Orchid Avenue Realty trading as Ray White Surfers Paradise Commercial divisions toward the recipient with regard to the use of this information and all information given is given without responsibility. 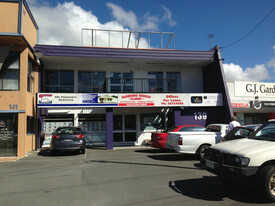 Main Road Retail / Office Plus Warehouse $2500 PCM + GST (includes.. This main road shop has been configured and set up with retail showroom area, offices and workshop/warehousing area. FEATURES: 200sqm Partitioned offices. Factory/warehouse area with roller door access from rear. Air conditioned offices. Wide frontage with excellent signage. Parking at front door and rear of property. Network cabled. Kitchenette Internal Bathroom amenities. PRICE: $2500PCM + GST (price includes outgoings) For more information and to arrange inspection, contact the local leading commercial agents Towers Francis Property. Previously a real estate agency, this shop would suit a myriad of uses, including retail, office users and consulting style businesses. This shop is located in prime corner position in the 'Tweed Heights' Shopping Centre. Current tenancy mix includes: IGA, Bottle shop, Bakery, Thai Restaurant, Pizza, Hairdressor and Realestate agency. FEATURES: 90sqm Approx prime exposure Abundant natural light. PRICE: $2800 PCM + Outgoings + GST. Other shops available for food retailers also. For more information contact the local leading commercial agents Towers Francis Property. 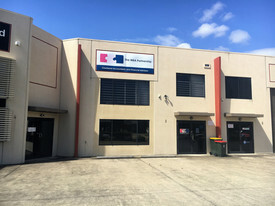 This unit is located with high exposure to Greenway Drive which is host to all the big name bulky goods retailers in South Tweed Heads. FEATURES: 197sqm NLA ( 166sqm ground floor plus 31sqm upstairs office) Fully fitted office areas with airconditioning High roller door access to warehousing area. Reception frontage with glass entrance doors. 3 Allocated parking spaces onsite. Long lease available. PRICE: $2500PCM + Outgoings + GST. For more information and inspections, contact Towers Francis Property. Office For Lease $550/month + GST + Electr.. This Property is close to Town and the Beaches of the Gold Coast. It has an old house with a large industrial style Awning and a circular driveway suitable for large trucks. Perfect property for a Business Person who needs space and storage. There is a large mobile home park across the road on land with the same land zoning. The property has two street frontages with approx 300 metres frontage to Piggabeen Road and 200 metres frontage to Skyline Drive. Full town services Town Water, Electricity and Sewer system. 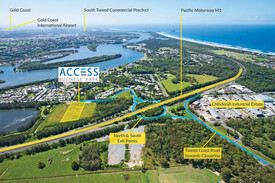 Positioned close to Cobaki Lakes development site there will be future access to Gold Coast Highway via Boyd Street Tugun right past John Flynn Hospital. Corporate Offices  Fully Fitted Out $4,500 pcm plus GST Incl ..